I have collected a number of different items. When I was a kid, it was Micro Machines and Hot Wheels. Then it was baseball cards. As I got older and wanted to get items from places I visited, I added shot glasses to the collecting madness. 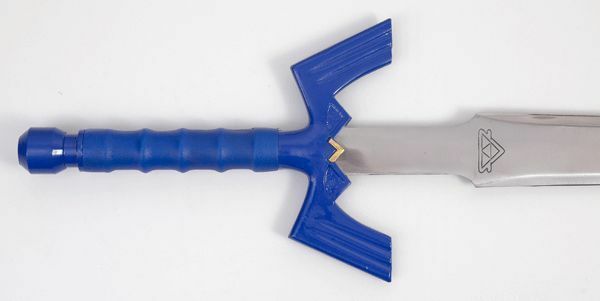 For a short time, I was going to toss in swords, but that really ended after I got my Legend of Zelda master sword (and yes, it is awesome). When I got to college, sports became a big part of my life again. I played when I was a kid and followed some of the major area teams, such as the Baltimore Orioles and Washington Redskins. When music took over my life during middle and high school, I lost touch with my appreciation of sports, only to realize what I loved about it when I was exposed to quite a first year of athletics at the University of Maryland. I was following the Washington Redskins and Philadelphia Eagles (and I know they are divisional opponents). As I continued diving deeper through fantasy football and spending my fall weekends glued to the TV and going to college games, I wanted to pick up some of the gear. My first Redskins jersey was #45 Chris Cooley. I followed this with an addition of 5 more jerseys, including #89 Santana Moss, #59 London Fletcher, #5 Donovan McNabb and #21 Sean Taylor’s Pro Bowl special edition. Arizona Cardinals – #11 Larry Fitzgerald: There is not much to be excited about with Arizona at the moment, but they still retain one of the most dominate receivers in the game today. With a decent quarterback and some supporting cast members, Fitzgerald can easily make the plays himself. Atlanta Falcons – #88 Tony Gonzalez: The Falcons have a great power offense with Ryan, White and Turner, but Gonzalez has been a staple to the NFL for years. Starting his career with the Chiefs, he has shown throughout the season that he still has what it takes to compete. 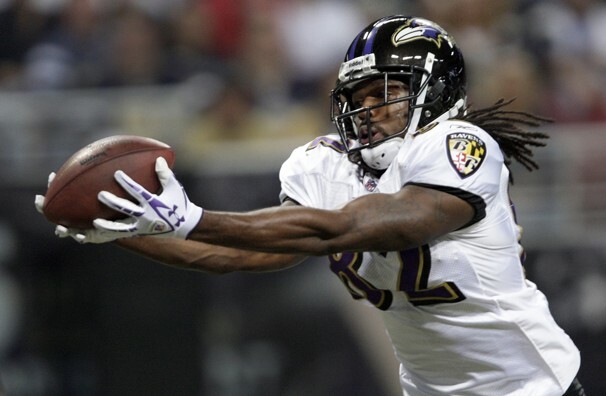 Baltimore Ravens – #82 Torrey Smith: With some many amazing players on this team, it is truly a tough call whether to go offense or defense. To go with the defense, Lewis and Reed may be in the twilight of their careers but continue to be dominate players. Oher has the emotional vote from his story to the NFL and Flacco, Boldin and Rice would be big picks are well. Smith is a former Terrapin and has taken advantage of his opportunities in this rookie season. He has a whole career in front of him and I would definitely love to support him. Buffalo Bills – #8 Brian Moorman: No offense. No defense. I am going special teams. There are some big names with the Bills. Fitzpatrick got that big contract extension and Spiller is a young, building talent. This may be one of the only punters that has a chance, but Moorman is a strategic pick and would be a great pickup for a fantasy team. Carolina Panthers – #1 Cam Newton: I was one of the nonbelievers when Newton was selected by the Panthers. I thought he overachieved at Auburn and was iffy about his drama with accepting benefits as a college student. Watching him play now shows me that the hype is definitely not false. He is a dynamic player that definitely will find his stride as the Panthers continue to rebuild. Chicago Bears – #54 Brian Urlacher: He may not be the dominate player he used to be. He may not be playing much longer than the end of this season. He is still a Hall of Fame player and will be missed when he finally bows out. Cincinnati Bengals – #14 Andy Dalton: This kid is a player. The Bengals have an inconsistent Cedric Benson and a corp of young receivers, but he is producing week after week. No one would have predicted the Bengals to be sitting at 7-4 at this point of the season, even with a rather strong defensive unit. 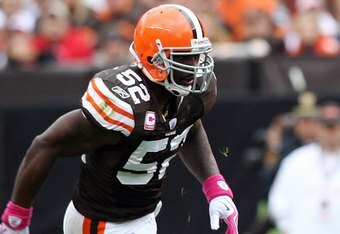 Cleveland Browns – #52 D’Qwell Jackson: When you are looking for a tackle hog, there are few better than Jackson. He was a star player at Maryland during an era when he had to share field time with Shawne Merriman. He is truly the anchor for this team’s defense. Dallas Cowboys – #19 Miles Austin: I may not like the Cowboys and I definitely do not like Tony Romo, but I just have to respect what Miles Austin can do out there on the field. Though injured this season, he commands immediate attention from any and all defensive backs. Romo may not continue to be a Dallas staple for more than another couple years but Austin will be hanging around for a while. Denver Broncos – #15 Tim Tebow: He may be the star of the moment but I believe he has quite the career if he can improve the passing game. You would think that a quarterback that cannot throw well would be out of a job quickly, but he is winning as a starter and below 50% pass completions. I am all about Tebow Time. Detroit Lions – #81 Calvin Johnson: Megatron! Johnson is a beast and only occasionally is held without significant productivity in a game. With a healthy Matthew Stafford in the mix, he has a chance to continue to become more dominant with each passing game. Green Bay Packers – #12 Aaron Rodgers: Who is Brett Favre? I have actually already forgotten with the way this young man is playing. 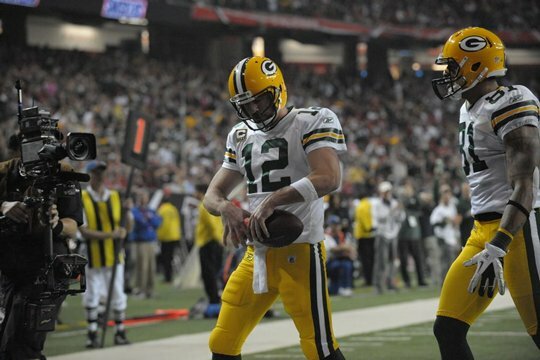 Rodgers is the start of a new set of dominant quarterbacks. What I really love about him is his modesty and inclusion of his teammates in celebrating his success. You cannot be a successful quarterback without some great blockers and receivers, right? Houston Texans – #23 Arian Foster: Possibly more significant now than Adrian Peterson, Foster is a hard runner and just knows how to find the hole in the defense. With Schaub going out, the Texans need him now more than ever. Indianapolis Colts – #18 Peyton Manning: Did you think I was going to say Curtis Painter? Manning is the icon of the NFL and will be back in the game within the next year. There is the possibility that the Colts will want to start thinking about their future beyond Manning and start building a team to match their hopes, but for now he is a Colt. Jacksonville Jaguars – #32 Maurice Jones-Drew: To be honest, there is not a single player on this team that excites me. I almost went with Josh Scobee because he seems to be the best scorer on the team. He is still relevant but the Jaguars are nothing to be energized about. Kansas City Chiefs – #82 Dwayne Bowe: Similar to the Jaguars, there is just nothing here for me. I was a fan of Cassel breaking away from the Patriots and finding a home in Kansas City, but he has not had it all fall into place and now is injured. Bowe is still a big-time receiver and may find a new rhythm with Tyler Palko. Miami Dolphins – #77 Jake Long: This is also a team that is rebuilding, but there are some big names trying to revitalize in Miami. Brandon Marshall just needs a quarterback with some consistency. Reggie Bush is starting to look like the runner he was meant to be (minus the weight of the Kardashians). None of the offense is able to be as successful without a strong offensive line, led by the intelligence and field vision of Long. Minnesota Vikings – #56 EJ Henderson: Minnesota is a team of random playmakers sprinkled into a team that needs a lot of work. Though riding on the power of Peterson, the anchor for their defense has been Henderson. The offense may be finding their place with their rookie Ponder, but their defense needs some attention to help support the aging linebacker. New England Patriots – #83 Wes Welker: This offense if full of playmakers. Of course Brady leads the pack and Gronkowski has become one of his favorite targets, but the intelligence and playmaking ability still is represented through Welker’s amazing moves and vision. New Orleans Saints – #9 Drew Brees: Whatever word you want to put before his last name, Brees is a playmaker and someone the Chargers must be kicking themselves for letting go. He is a clutch passer who has developed with a great, balanced wide receiver corp and a now developing backfield. New York Giants – #88 Hakeem Nicks: The former Tar Heel quickly made a name for himself in the NFL and commands a double-team whenever he goes deep. He has the height and the speed to dominate defensive backs, much in the way Calvin Johnson does. New York Jets – #60 D’Brickashaw Ferguson: When you’ve got some offensive talent like the Jets have put together and with the pressure that Sanchez receives, you’ve got to have a strong anchor on the offensive line. The former Virginia star has stopped many a blitz from taking down the quarterback or stuffing the rushers in the backfield. Oakland Raiders – #85 Darrius Heyward-Bey: Without a consistently strong quarterback, he has not been able to produce and has struggled to develop in the NFL with the same degree of dominance as he showed in college. Maybe Carson Palmer will help to remedy this issue. Philadelphia Eagles – #25 LeSean McCoy: Michael Vick may be the focal point of the offense but this dream team has not lived up to expectations this year. McCoy, on the other hand, has been one of the best runners in the league with top 10 performances in yards and touchdowns on the season. Pittsburgh Steelers – #43 Troy Polamalu: If the jersey would come with the hair, that would be awesome. Besides Ray Lewis and Brian Urlacher, Polamalu is the icon of NFL defensive players. He makes the big plays at all the right times and he is just an honest, nice guy. San Diego Chargers – #9 Nick Novak: Obviously the Maryland theme may be evident, but this guy was the all-time ACC points leader as a college kicker. He may not always be clutch in the NFL, but I saw him play in college and I have my loyalty with this guy. The rest of the team is really underperforming and needs to step it up. 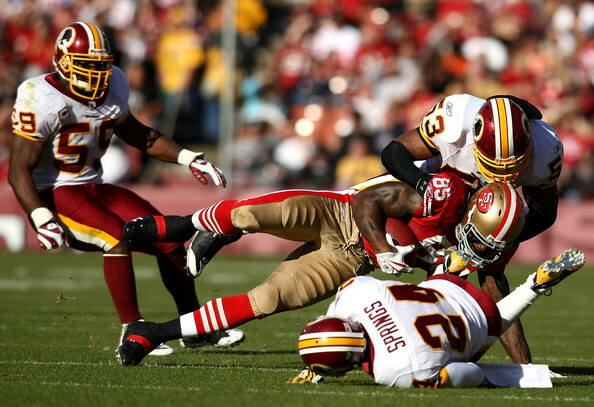 San Francisco 49ers – #85 Vernon Davis: With a steady quarterback, Davis is a big body with big hands and can make the big plays. Alex Smith seems to be back on track overall but needs to start looking downfield and let his stellar tight end make a play on the ball. Seattle Seahawks – #24 Marshawn Lynch: While with the Bills, he was clearly a playmaker. Buffalo wanted to go with the talented Fred Jackson, which gave Lynch a new opportunity on the west coast. He is a hard runner and had one of the best plays of the year last season when he broke 8 tackles to dominate the Saints for a post-season victory. St. Louis Rams – #55 James Laurinaitis: The Rams have not had as much to be excited about after losing Holt, Warner and Bulger over the years. The defense definitely got a boost when they picked up the young Lauinaitis, whose name is starting to be in the conversation with some of the most integral linebackers in the league. Tennessee Titans – #8 Matt Hasselbeck: Seattle had all but given up on Hasselbeck and he has been given a second life with the Titans. 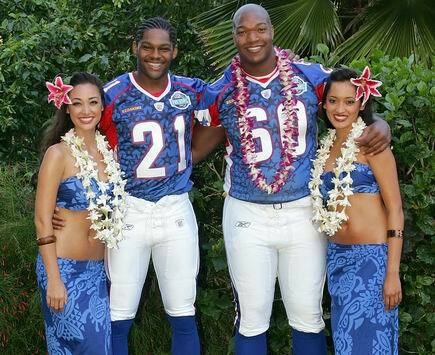 I liked him as a quarterback because he always just looked like a fighter, especially back in the Shaun Alexander days. Washington Redskins – #20 Oshiomogho Atogwe: Finishing up with my favorite team, I need to add another jersey to the defensive side of my collection. I definitely like Roy Helu and Fred Davis on offense, but their production is only increased at the moment because of the injuries to Tim Hightower and Chris Cooley. It will be interesting to see if either of them continue to show promise but the defense is actually playing well overall. Atogwe adds a presence to the pass coverage we have lacked since the loss of Taylor. I am not sure if this collection will start too soon, but I definitely considering a couple jerseys to get it start, including Rodgers, Davis, Smith and Jackson.